Flat Face Drum Type Conveyor Pulleys are available in standard diameters. Custom sizes also available. Crown Face Conveyor Pulleys with machined crowns are available in all standard and non-standard sizes. Hub and Bushing Styles available in XT, Taper-Lock, QD, and Keyless Hubs. In-house Lagging gives Monarc the flexibility and quick turnaround that can detour costly down time for its clients. Ceramic Lagging - incredible durability for the most demanding applications. Available in 20%, 39%, and 80% coverage. Lagged Conveyor Material is available in standard black, white, food grade or urethane. It is offered in three styles, weld lag, slide lag or vulcanized and comes in three patterns; smooth, herringbone and diamond cut design. Lagging is primarily used to improve traction capacity, resist abrasive conditions and extend pulley and belt life. 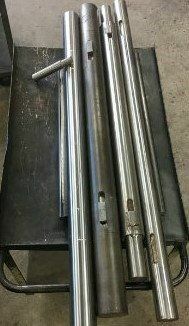 Monarc also has a wide selection of specialty lagging to meet your unique application requirements. 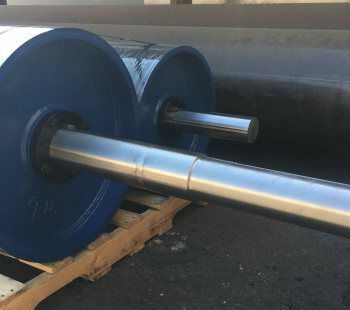 Monarc Also has a full line of Stainless Steel Rollers and Drum Pulleys. All standard sizes available Lagged or Non-lagged. 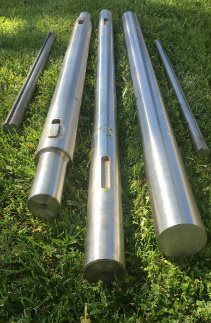 V-groove rollers also available in all standard sizes. Monarc has the knowledge, expertise and ability to design and manufacture pulleys for modern, high capacity systems. Monarc offers three grades of pulleys for extreme loads and environmental conditions. Monarc is fully integrated and ready to meet your needs on any size shafting. We stock all standard sizes and have the ability and expertise to do any key way or turn down that you need. Stock includes 1018 and 1045 TG&P material. Other material available upon request. Monarc Bend Pulleys, Take-Up Pulleys and Gravity Pulleys are all offered with hubs, bushings, internal bearings or hex bearings. No One Beats Monarc Expertise, Service and Warranty!